I bent down to pick up one of three water bottles that lay scattered across the mud bank, but my hand froze when I spotted the fresh bear tracks next to it. A raging thirst had made me hike back to where the boat had dropped us and where I knew basic supplies were left in case we ran out. In less than an hour before my return a bear had found the courage to leave its den and search our survival necessities for a midday snack. No wonder the bottles were lying all over the place. 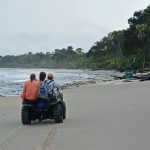 I looked up to the mountainside and counted at least five big caves in a fifty metre radius from where I was standing, right next to the bear tracks. Bullets of sweat drenched my forehead and I became more nervous than the day before, when I squatted next to a heap of fresh bear dung. 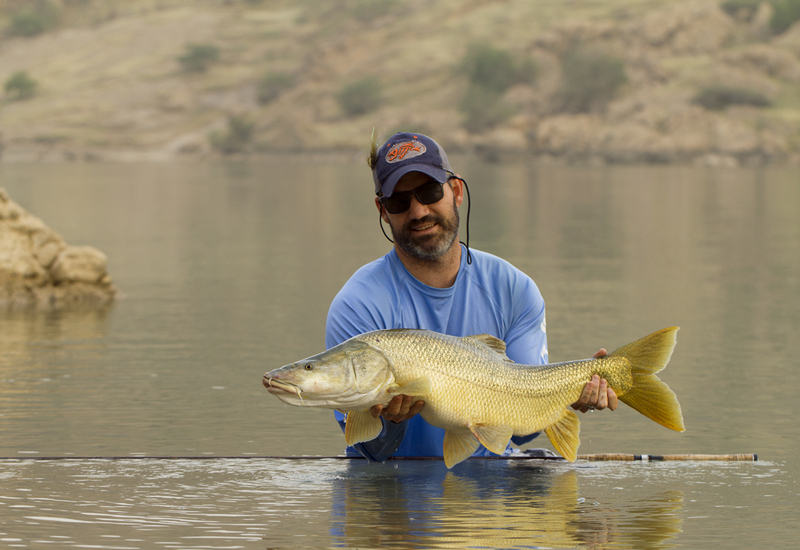 Gerald Penkler proudly ticking the species box with his first mangar on fly. 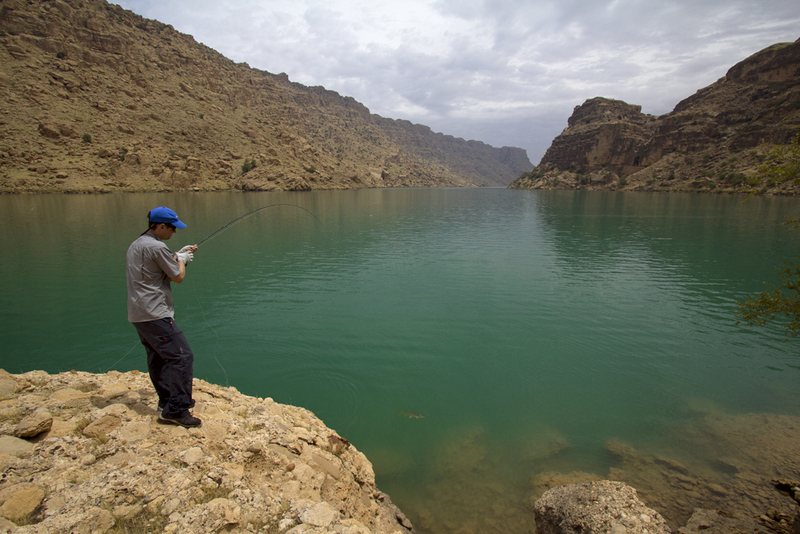 We (Ewan Naude, Gerald Penkler and me) were on a fly fishing exploratory trip in southwestern Iran, fishing for fun of course, but the last danger we considered to encounter were bears. Instead we expected obnoxious military officials, perhaps Iranian backcountry gangs or even snipers as we were 100 miles from the Iraqi border, but there were none of that, only 500 pound bears snooping around us amongst double story boulders in broad daylight. According to Seana, our guide, there were Asian black bears and Syrian brown bears where we were. Never had peace and quiet, far away from the friendly Persian people on this trip, felt so eerie. 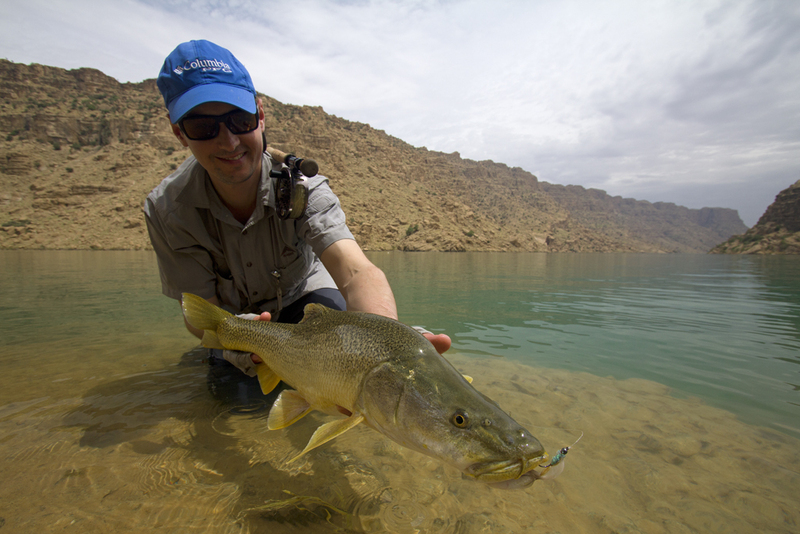 The mood-changing mangar that Ewan Naude caught in front of camp, a fish that got us all excited for the last day in Iran. I gathered the courage to walk a mile back alone to where my angling friends were stalking fish. Singing a bear song to make more noise than usual, hoping to alert bears scavenging behind hidden corners, I carried on fishing, searching for large surface-cruising barbs. The two main species we travelled all the way to Iran for were shirbot and mangar (aka the king barbus). 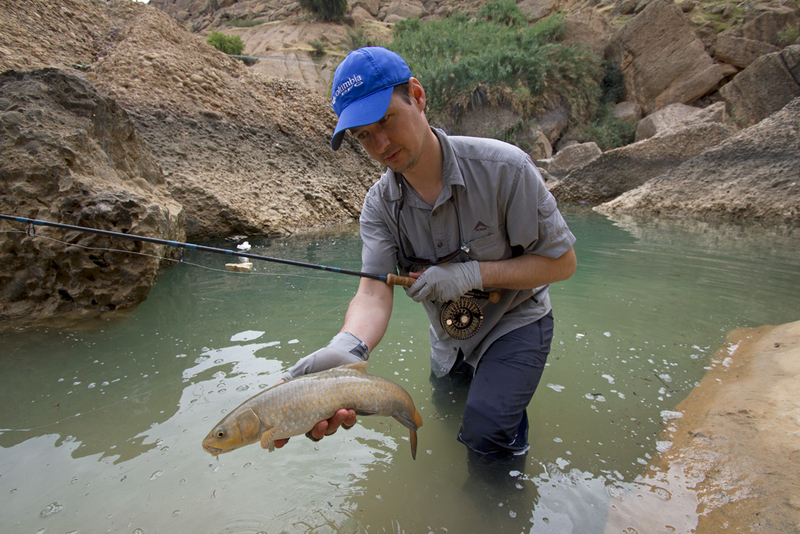 Gerald Penkler with the shirbot that completed his fishing week in Iran. 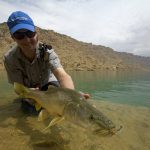 Ewan had stumbled upon photos of mangar on the internet and since we were all fanatic about catching large South African barbs, the yellowfishes – although dwarfed by mangar, he didn’t have to beg us to join him on this fishing adventure. The large shirbot we found were an added bonus and saved what would otherwise have turned into a rather unsuccessful trip. An ill-timed release of water for hydro-power generation from a dam upstream had sunk our expectations to catch mangar, a fish rather sensitive to water changes, in good numbers. 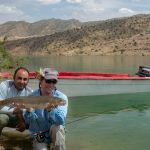 For instance, it is not unusual for Seana’s clients to land twenty mangar in a day; however, we only managed to scratch together five fish during the six day trip, of which four were landed on fly tackle. The shirbot were more accommodating though and their habit to swim near the surface and subtle approach to small food particles also meant that they were ideal for fly fishing, in which case small flies presented with care fooled a lot of these fish. In fact we caught so many that the two boat skippers, both local commercial fisherman, could not stop talking about it. They were used to seeing only three of these fish or so caught on spinning tackle in a week. They also remarked that we caught more fish in a day than what they’d gather with nets in the same time. Ultimately, it was the shirbot that made climbing boulders and braving bears worth every mile we searched for fish in the Iranian highlands. In the changing conditions we experienced we found that shirbot were the most accommodating fish and many were caught on fly. Gerald with another beautiful fish caught near a small river inlet.